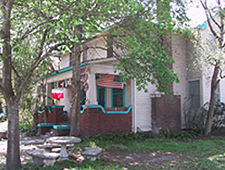 Houston International Hostel - The Small Hostel in the Big State. We are the most convenient hostel to downtown (10 minutes) using public transport. In the heart of the Houston Museum District adjacent to the Texas Medical Center with the lowest price in Houston. As the fourth largest city in America, Houston is a very diverse city with lots of experiences to be found. If you're tired of traveling, you can laze about on our big front porch or under our trees with all the comforts of home. Going into our 4th decade, we've served many thousands of world travelers. In keeping with the hosteling philosophy we've kept our prices low. Although our century old house has a patina of old age, it is a feast for the eyes boasting a museum quality African exhibit and Native American artifacts as well as other fine art. We do appreciate it when our budget travelers follow the hostel customs of old times. In 1983, as a founding member of the Texas American Youth Hostel, now Hosteling International, we served AYH members for 13 years when we began allowing non-members to participate in the hosteling spirit. We still believe in the core philosophy of cleaning up after yourself and leaving no trace except taking home all the new experiences of people met along the way.